I checked the rain gauge when I got home from work yesterday, May 1st, and it appears that we got 4.5 inches of rain between Monday, April 30th, and yesterday at 5:30 pm. At 9 pm, I checked the rain gauge again and it had another inch of rain in it. I don't know if this rain gauge is right so I might set up a second rain gauge to compare it to. I actually have the other gauge, but it doesn't measure rain very well when it is sitting on the counter inside. I once had a weather station with a digital rain gauge that measured rain to .03 of an inch based on the rain passing through the gauge. There's a name for that type of rain gauge... uh, uh. Let's just call it a digital rain gauge. I loved that thing until the day the transmitter stopped transmitting the info to the base station inside. 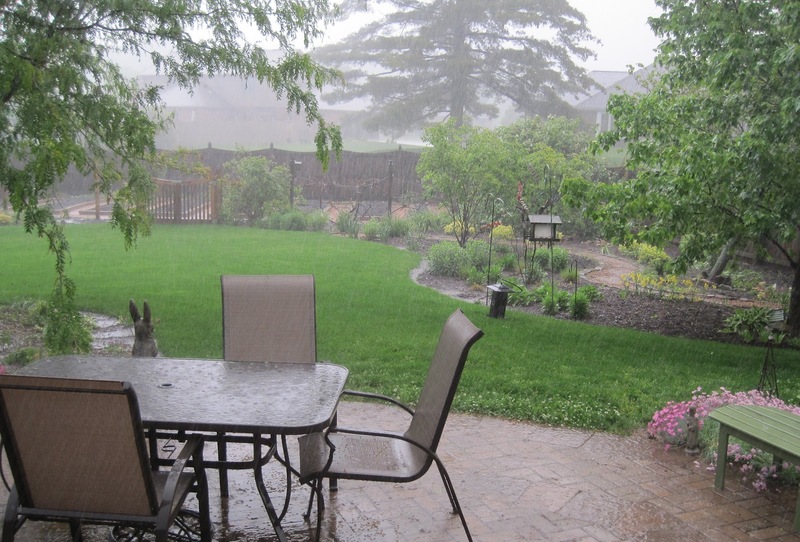 I was confident that I knew I exactly how much rain fell on my garden when I had the digital rain gauge. Confident. I also have an official 1970's style U. S. Weather Service issue rain gauge that my dad once had. He got it from a neighbor who was an official U. S. Weather Service forecaster. It is a great big round pipe with a inverted funnel top that catches the rain and funnels it into a smaller inner metal tube. It has a special measuring stick to go with it. We almost lost it from the family when my sister put it in a garage sale with a price of $1. I got over there just in time and bought it from her, though I'm not sure how she decided it was hers to sell. It's nearly two feet tall so I haven't installed it in my garden, yet. Someday, I'll set it up, along with the one currently inside, plus maybe get another digital rain gauge. Then I'll be more certain of how much rain falls on my garden. I'll also have a good start on a rain gauge collection. Though, I swear, I don't collect things, I just end up with things I like in quantities of more than one. All this rain. My garden is soaked and there is standing water in some areas. I heard the weatherman say today that May is the rainiest month of the year here in Indianapolis. I have no idea why in all my years of gardening, weather watching, and planting so much in the garden in May I never knew this. But I didn't. Now I do. Rainfall averages in Indianapolis vary depending on the sources checked. Some say it is as high as 5.28 inches on average in May, others put the average closer to 4.5 inches and indicate July is the rainiest month. But the weatherman on TV said it is 5.05 inches and May. I'm going with that because the weatherman would surely double-check his facts to get it right. I still love May, though, even the rainy days, and look forward to each and every day of it. Isn't the saying April showers bring May flowers? So, don't feel bad that you didn't know May was the rainiest month. :) It is hard to find a good, quality rain gauge. Good thing you were able to save the US Weather Service issued one. What was your sister thinking, LOL! It sounds like you got all of your May rain in one day. So this is where our rain has gone. I knew it fell someplace, just not in my garden. Here is to the rains of May bringing many flowers and veggies later on. We have three rain gauges here, including one that is digital with a station inside the house. All three are always different when it rains in the amounts. We usually have April showers but April had March winds and was very stingy with moisture. Here, the 2nd of May, it is quite cool and drizzly. I hope we get rain in May but only after 8 p.m. and before 5 a.m. I'm curious - do you "catch" your rain to save for later? Rainbarrel, cistern, raingarden? All this rain is making me feel sad that I don't yet own any rainbarrels! I'm jealous of all that rain. We had another 1/2 inch - which I measure in a cat dish we leave on the deck. We have broken too many rain gauges. Should we get some heavy rain our dirt road will be able to handle it - new drainage work is almost done. Although it's raining water is drained and the ground dries out. Then the Sun shines. Whew. Good catch on the rain gauge. What was your sister thinking? Oh, this must be the non-gardening sister. I'm envious of your rain. I already have a close personal relationship with my garden hoses.